Myanmar is a fascinating country with a rich cultural heritage. On this private tour you will discover the highlights of Myanmar including Yangon, the temples of Bagan and the fishing villages on Inle Lake. Not only will you see the highlights of Myanmar, but also you'll learn about this rich Buddhist culture. This adventure itinerary includes trekking in Kalaw where you'll visit hill tribes and learn about Asian elephants. This trip also includes 2 cultural tours in Yangon: an evening tour upon arrival and a morning market tour before departure. This trip is easy to combine with Thailand with daily flights between Bangkok and Yangon. Contact us for a customized itinerary with more or fewer days in Myanmar. On arrival at Yangon airport meet your guide and transfer to the hotel. 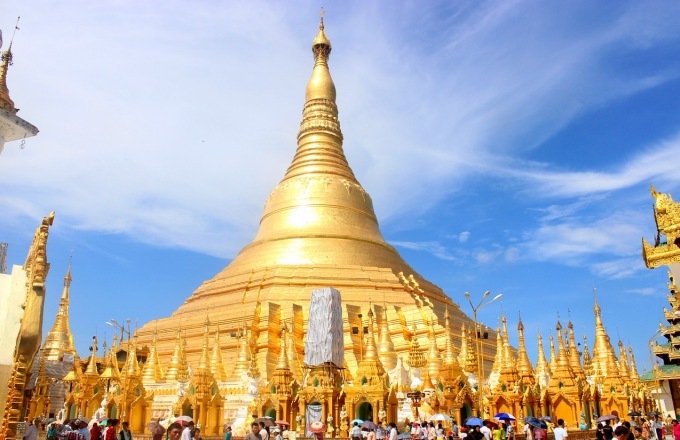 In the afternoon, enjoy guided visit to the remarkable Shwedagon Pagoda. At the end of the day, many Yangonites leave their office and on the way back home, they'll stop for some shopping at a market, catch up with friends at a teashop, visit a pagoda or go grab a beer. This is what you are going to do as well this evening. The highlight of the tour will be this evening's visit to the illuminated Shwedagon pagoda – a magical and mystical moment since it’s not very busy on the main platform in the evening. After the pagoda, we'll head out to taste local snacks as well as a local draft beer or a fresh lime juice. This tour includes drinks, a walk over the night market in downtown, tea and snacks as well as a tasty bowl of noodles among the locals. After the tour, we'll return to your Yangon hotel for your overnight. After breakfast transfer to the airport for your flight to Bagan. Upon arrival you'll be greeted by your guide and embark on a full day tour to the best temples in Bagan. A full day tour by car, with an experienced guide through Bagan, will show you the very best known temples of the area. We start the day climbing a pagoda to get an first impressive view over the whole area. From here, you and your guide will plan your way through this complex of amazing temples that have been here for hundreds of years. Places like the Ananda, Dhammayangyi, Sulamani, and Thatbyinnyu will certainly impress you. Lunch will be taken at a local restaurant and around 4pm we'll continue the tour by horse cart to Pyathagyi pagoda for sunset where some refreshing drinks will be served. While winding your way though Bagan, Whenever you see a temple you like, just ask you guide to stop to have a look at it. Following the tour, we'll return to your Bagan hotel and overnight. Today explore more of mesmerizing Bagan by bike. Joined by your guide, this is a fantastic way to have special private moments among the ruins and take phenomenal photos. By the afternoon, you will be back and can relaxing at your hotel. After breakfast transfer to the airport for your flight to Heho. Transfer to Kalaw to discover rural Myanmar culture. Here you'll visit a protected forest in an area that has been developed to support sustainable tourism. You'll meet with a guide specialized in elephant conservation. On a half-day trek (approximately 2 hours of hiking time) you'll head through the forest to a village. Upon arrival you will meet the village elders and then have the chance to help prepare dinner with the local hill tribe people. The overnight is in the village monastery where beds will be prepared with linen from a hotel in Kalaw. Breakfast in the jungle will be a local style meal. In the morning your guide will take you to an elephant camp (approximately 2 hours walking) where you will learn more about community projects in the area. You can help feed and wash the elephants and learn some basic commands used by the mahouts. This is a unique and unforgettable experience! After a simple lunch you'll return to Kalaw by pick-up truck and then continue on to Khaung Dine and your hotel. After breakfast at the hotel your tour continues to visit the lake. On and around the lake, traditional markets are held in different villages according to a 5-day rotating schedule and today we will try to fit in one of the traditional markets frequented by Shan and Pao people living nearby. Inle Lake in southern Shan State is a vast natural lake surrounded by traditional Shan villages. On the lake itself the Intha people have been living for many centuries in villages built entirely on stilts on the lake. Today we will take you by private motorboat around the lake to discover its natural beauty, visit the floating gardens, hopefully see some of the famous leg rowers and have some tea at a local family’s house. We will certainly also visit a local cheroot factory (where the Burmese cigars are made) and if desired we visit a weaving factory. Toward the south of Inle lake you'll discover the Indein ruins. Partly covered by vegetation these ruins resemble a pagoda forest. After visiting the ruins walk for about 1 hour to a vantage point over the lake and the Sae Ma village. Enjoy a homemade lunch in a local house. Finally continue by canoe to the Phaung Daw Oo pagoda. After returning to your hotel transfer to the airport for a flight back to Yangon. Upon arrival transfer to your hotel. Get up early today and enjoy a guided visit to discover more of traditional Yangon. You're guide will pick you up at 6:30 AM and take you to a busy fish market on the Yangon River. Afterward continue to a vegetable market where you can enjoy a famous Burmese breakfast called Mohinga: it is a mild fish stew with noodles and crackers. Part of Burmese culture lies in its Buddhist traditions. You'll witness monks passing through the streets to collect their alms and be able to donate some food to them. Finally continue to a fruit and vegetable market before heading back to your hotel where you can enjoy a full western breakfast. For the rest of the day a guide and car will be available for some extra shopping and to go for lunch before transferring to the airport for your flight to Bangkok or elsewhere.